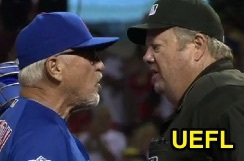 HP Umpire Joe West ejected Cubs Manager Joe Maddon for arguing pace-of-play procedure/mound visit enforcement (Unsportsmanlike-NEC/Rule 5.10) in the bottom of the 9th inning of the Cubs-Cardinals game. With none out and none on, Cardinals batter Jeremy Hazelbaker hit a 0-2 changeup from Cardinals pitcher Kyle Hendricks for a home run. Replays indicate that after the home run, Cubs catcher Miguel Montero visited Hendricks on the mound and returned to home plate, after which several Cubs infielders visited Hendricks on the mound as substitute Aroldis Chapman warmed in the bullpen (Chapman eventually did replace Hendricks after Maddon's argument and ejection), and that West attempted to break up the delay, pursuant to pace-of-play directives & Rule 5.10(l), the call was irrecusable. * At the time of the ejection, the Cubs were leading, 4-1. The Cubs ultimately won the contest, 4-1. This is Joe West (22)'s fifth ejection of the 2016 MLB regular season. Joe West now has 10 points in UEFL Standings (8 Previous + 2 MLB + 0 Irrecusable Call = 10). Crew Chief Joe West now has 8 points in Crew Division (7 Previous + 1 Irrecusable Call = 8). *Rule 5.10(l): "Any attempt to evade or circumvent [the maximum of one mound visit per batter] rule by the manager or coach going to the catcher or an infielder and then that player going to the mound to confer with the pitcher shall constitute a trip to the mound." This is the 159th ejection report of the 2016 regular season. This is the 64th Manager ejection of 2016. This is Chicago's 4th ejection of 2016, 3rd in the NL Central (PIT 13; CIN 6; CHC 4; MIL 3; STL 1). This is Joe Maddon's 3rd ejection of 2016, 1st since July 5 (Jerry Meals; QOC = N [Balls/Strikes]). This is Joe West's first ejection since September 4, 2016 (Terry Francona; QOC = Y-C [Check Swing]). Wrap: Chicago Cubs vs. St. Louis Cardinals, 9/12/16 | Video available via "read more."